But to get back to Repeat After Me, let's talk about their aesthetics for a second. You can purchase a digital copy of this album (recommended) for $5, but for $18 you can purchase a vinyl that includes a free set of crayons for you to color in the cover. For crayons, 20 minutes of fun, and a chance to exercise your own creativity, I'd say that's a pretty clutch deal. You know what else is clutch? Mapmaker. This is a beautifully constructed album -- plain and simple. 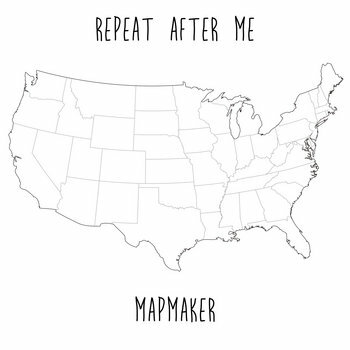 You're eased in to what seems like a glittering pop confection with "Mapmaker," before being whisked into more contemplative territory with songs like "I'm Going Back" and "Carve Out a Name." The standout track for me is "San Francisco" -- maybe it's a little silly, but sometimes you need a silly song to leaven Mapmaker's ultimate achievement: building intelligent but crafty music.